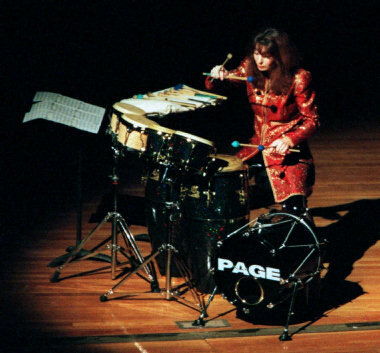 Evelyn Glennie Interview with Bruce Duffie . . . . . Within the vast community of music performers in the world, many are competent, some are truly wonderful and a very few are extraordinary. 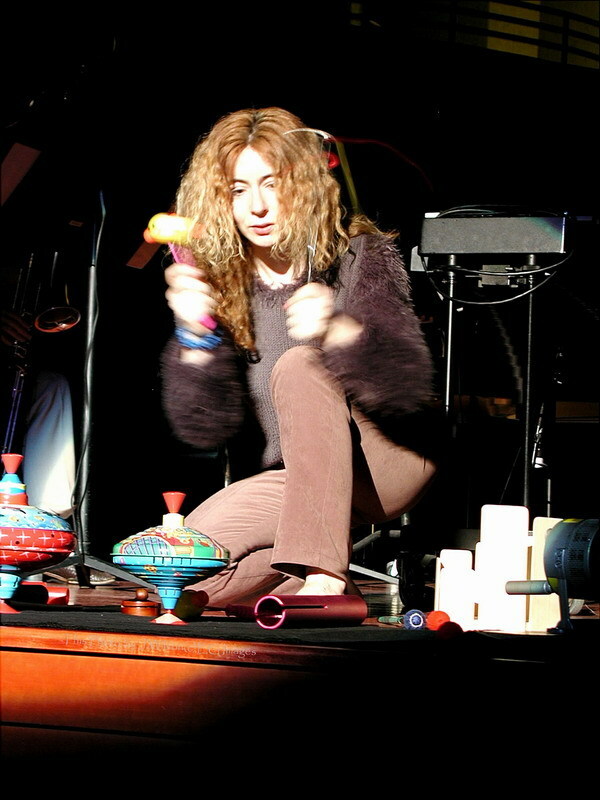 Evelyn Glennie is among that rare group on the top who not only bring special value to their artistry but give of themselves in a unique way. For the details of her background and current performing schedule, I'll direct you to her website which is listed in her biography at the end of this interview. Suffice it to say that she has taken this specific arena of music and made it her own in such a way as to enhance it and develop it and mold it into something unexpected until her arrival. Glennie performs both alone and with ensembles all over the world. It was on her tour early in 1994 that she came to Chicago and I was fortunate to be granted about 40 minutes for a conversation. Hearing her speak, one would never guess that she is deaf. After having my beard and mustache trimmed for the occasion, I made sure to always face her directly and to enunciate things clearly. She read my lips with accuracy and responded to my questions with thought and wit. Here is much of what we talked about that afternoon . . . . .
Bruce Duffie: Tell me the joys and sorrows of being a traveling musician! Evelyn Glennie: [Laughs] Well sometimes I wish I played the pennywhistle! No, it’s something that actually takes a huge amount of organization, to move, perhaps, half a ton of equipment around. So, we’re working very, very hard to sort out the equipment. For example, I have a marimba based in Tokyo, one in America, and three at home so that we can have them in different places within Europe. That’s basically how we’re trying to work all the equipment so that we can actually have duplicates. BD: You’re like the people who play piano, and have a piano each place. EG: Well, we’re getting there. But you know, it’s very important that I play on equipment that I know, that I’m familiar with. That just makes me, obviously, feel more comfortable. And also, a lot of the pieces are written for me and for the instruments that I own, so sometimes I have to use my own equipment! But it certainly makes me feel better. BD: Is there not a lot of standardization of marimbas and xylophones, and all of the other percussion instruments? EG: There’s a great deal of variation, actually: different sizes, different feels, different materials that are used, different heights, and so on. It takes a wee while just to get to know an instrument, and the wonderful thing about playing on my own equipment is that I know how each one can speak. I know how I want them to be tuned, and so on, and that’s very important at the end of the day. For example, if we think about a multi set-up — more than one instrument — then I would tune the instruments in harmony with the piece, and that doesn’t necessarily happen when you’re using unfamiliar equipment. It may be that you simply can’t get the pitch that you’re after, or the type of sound or color or the resonance that you’re after. Just lots of little tiny, tiny subtleties like that come into consideration. BD: Are you your own technician, or do you have others that help you with the tuning and the regulation? EG: [Laughs] Well, I do have a percussion technician, and they certainly deal with the setting up of the equipment, the looking after of the equipment, and so on. And in the past, I’ve had a body who has been able to tune the instruments to how I like it. But at the end of the day I just like to do that myself, and it allows me to really home in on the instruments, get to know the equipment, find out the different possibilities, as opposed to having that done for me and then walking on, not really having explored the different sounds available. BD: Because of your lack of hearing, how would you be able to differentiate between subtle colors, and even pitch? EG: It’s a good question, and this is something that I find I have to explore a lot with the equipment. For example, I may just have one tom-tom and I’ll remove the head completely. Then I’ll pop it on and just start from the head being really, really slack. I’ll work my way up and just take my time to know what things feel like — what kind of experiences I’m having. But all the time, I know the type of sound that I’m after, whether it’s reverberant sound or a kind of dead, dull sound, whether it’s a bright sound or a short, sharp sound, whatever. Just little things like that and I just work my way through the drum to really, really get to know the real subtleties. Obviously someone has to say what’s happening with the instrument, or if there are any overtones or harmonics, but generally I just like to work it out myself. BD: Do you find, then, that working with lots of different instruments, you have to keep all of these dimensions in your head for each one? EG: Well, that’s very true, actually, although I do find that depending on the hall I’m playing in, I may have to tune the instruments differently, or I may have to choose different sticks, according to the acoustic of the hall. This is something that I do all the time, so I never really know how I want things until I have a wander around the hall and just get to know the place. Fr example, it’s quite important that if I’m playing a concerto with an orchestra, it’s quite important that I stay for the rest of the rehearsal, i.e. the orchestra’s own private rehearsal, so that I can get an idea for the acoustics and just how the whole thing functions. BD: Now, are you hearing any of this, or are you feeling all of this? EG: It’s a combination. I can’t say one or the other. It depends on the size of the hall and it depends how close I am to the musicians. It depends on all sorts of things so I’m not willing to say it’s one thing or another. It’s just that I experience it, just as you do. BD: But a lot of it, then, becomes such a tactile experience for you. EG: Yes it does. It’s something that I don’t analyze. I really don’t analyze it because I’m just after a particular thing that I’m thinking about, and I’m not thinking about how I get that. If I find it, then that’s great because I know it’s going to change for a particular hall. BD: Does it change from audience to audience? EG: Yes, it certainly does. I think this is a problem when you rehearse and then when you actually perform, because suddenly the hall can change considerably. In a way, this is something that you have to find out during the rehearsal, so basically I just ask other musicians. I say, “How does the hall change when the place is full of people?” or half-full of people, or whatever. So we try to find out how many people will be attending the concert, just to give us an idea. But if someone says, “If you sit up there, you’re going to hear the brass very well, or if you sit down here you’re going to hear the strings very well,” then that’s an impossible task. You just have to play how you feel, and try. BD: Because your music is tactile as well as aural, do you strive to make it more than just an aural experience for the audience? EG: In a way I do. Basically I play how I feel at that particular moment. So, I suppose, I’m a fairly instinctive player, but by that I mean I just literally walk on, not knowing what’s going to happen, and that I just like to have complete freedom over the interpretation. I very, very seldom copy what I’ve done in my own private rehearsal session. Sometimes it works and sometimes it doesn’t! [Both laugh] But this is part of the drama or danger level that I think is so crucial in my own performances. But in a way, because there’s this openness to my playing, where yes, I’m prepared but I’m willing to change things during the performance, it means that you never really know what’s going to happen. I try to project this kind of openness to the audience as opposed to projecting a very sort of analyzed performance. So I suppose I play from the heart and try to make it feel as though it’s just sort of there — it’s happened at that particular moment, as opposed to preparing something and then letting them see what I’ve been working on for the past few weeks. It’s difficult to describe; it’s difficult to explain. BD: Does this freedom scare your colleagues? EG: [Laughs] Oh, I don’t know! If I’m performing with my pianist — and we’ve performed together for a long time, since 1986 — we know each other backwards. So if my pianist decides to go off somewhere in the music, then that’s fine. I’ll be there with him. And likewise, if I suddenly change the tempo or completely change the mood or something, I know he’ll be there. This is part of the fun, really. In a concerto situation it’s harder, because, obviously, you may have fifty or eighty musicians behind you. So I suppose I have to be a wee bit more considerate! [Both laugh] But nevertheless, if I have three or four performances of the same piece with the same orchestra, then they’re usually pretty willing to try different ideas. And I think that’s a great thing. Once you learn the rules, you can then break them! BD: Well, how far can you break the rules? EG: [Laughs] Well, you know, I involve a lot of improvisation within the notated music I play and I find that I have to have this kind of freedom. I don’t know why; it’s just the way I am. Basically I learn the piece as I see it on the page, but that is done away from the instrument. I don’t mean that I simply have the music memorized, but I just mean I can quickly look at the music and know what it’s about. Once I have this almost visual memory, then, I go to my instrument and really I don’t have to worry about the actual mechanics of playing because I’ve been thinking about the music first of all, and working out the technical difficulties within my mind. If you do it this way, it means that everything you think about is always perfect! So immediately you have positive thoughts, and then when I get to the instrument, I’m concentrating on sound, on color, on effects — lots of different things like how I want to interpret the music and how I want the instrument to speak. BD: Do you ever achieve that perfection? EG: No. No, I’ve only once, actually, moved myself by a piece. I can’t really remember the piece, even, but it was many, many years ago. When I finished the piece, and I was silent! Within my mind, I was completely silent. Normally when I finish a piece, I walk off stage or sort of stop for a while, and immediately the piece is rushing through my mind at a million miles an hour. And you know, lots of things are thought about within that split second, including mistakes. I certainly play wrong notes, which I try as hard as possible to eliminate, of course. But a mistake is if I haven’t phrased something the way I want to, or if I just didn’t quite get the effect that I want to in a particular place. That, for me, is a mistake, and when I think about it, it’s enlarged a hundred times! I feel that every member of the audience has spotted that mistake and I feel terrible about it! So at night, when I lie in my bed, I go through the piece and I go through every move, and that’s that time when I actually analyze things and learn for the next time. BD: Can you over-analyze it? EG: I think so. This is why I like to keep this openness in my playing, so that if I’ve played a piece a hundred times, I still like to treat it as a child would, with a completely open mind. Sometimes I may deliberately make myself change the interpretation so that I don’t become too square with it, or take the way I’m playing for granted. There are pieces in my repertoire that I’ve played so often and if it’s with piano, then we try desperately hard to change the interpretation, because there’s only my pianist and myself. Whereas if I’m giving a concerto, it changes naturally according to the conductor and according to the orchestra, and that’s great! You’re always finding new ideas, new possibilities. Some of them you like, some of them perhaps I’m not so keen on, but that’s the way that you learn about the piece more. BD: Are you ever at odds with a conductor? EG: [Laughs] Well honestly, I can really say that I’ve had a great time with the conductors. There’s only one occasion when I found it very difficult working with one and it was just that he had very strong views as to the music, and likewise, I did, too! So it was just a case of give and take, and experiment. But really, all the conductors I’ve worked with have kept a very open mind because many of them have not necessarily performed a percussion concerto before, so the whole idea is new. And so I have to gently break the music to them, because it’s unfamiliar repertoire and quite often has been written for me. So I’ve had the added advantage of having conversations with the composer and seeing the piece grow from a blank page right to the performance. BD: When a piece that grows in front of your eyes, do you help it grow through the composer’s pen? EG: I like to think I do in that first of all we discuss the music, the type of piece, the practicalities. That’s a very important point when you’re a percussionist — whether it’s a piece that you can perform over and over again. If it requires just masses of equipment or unusual equipment, then it’s very difficult to put something like that on. I like to perform the piece a lot. I want to have it in my repertoire and I want to introduce it to people. So that’s important to speak about. But also, as the composer is writing away, he or she may continually send bits of the piece to me, and I’ll comment on it, or see whether it works, or whether they’re on the right lines. Some composers just like to be sort of locked away for six months or a year where they don’t want any contact, and then they’ll produce the finished product and I’ll comment on it at that stage. So it can vary, but normally I have close contact with the composer, which I like. And then the sort of learning stages happen when we go through the performances. So even now, for example, with James MacMillan’s Veni, Veni Emmanuel, which is a fairly recent percussion concerto, every time we play it we’re always thinking of new ideas. For example, I may say to James, “Oh, why don’t we try a different instrument?” and he’ll be quite open about it. If he feels confident that it may work, then we’ll give it a go. BD: Do you find that if a composer is writing for you, they’re under an obligation to use every last instrument and every bit of technique that is in your hands? EG: [Laughs] Well, no, fortunately! I basically invite them to my rehearsal studio, and at least they can see all of my equipment. I think that’s important. However, we do talk a lot about the practicalities, and some composers like to write for just a few instruments, maybe even one! And, you know, this is great. They must write something that they feel comfortable with. I’ll basically go through the instruments with them, so I’ll talk about the various techniques, the different ways of notating percussion, because we’re still going through a stage where there is standard notation for some instruments, but not all. Just different things like that so that they get a feeling for my style of playing, and then they can write accordingly. It’s usually a pretty important time, really, this initial meeting. It’s just to introduce them to lots of different things. BD: Would it be frustrating for you, then, to have a concerto for snare drum? EG: Would you believe [laughs]! For my concert in Cincinnati I’m actually performing two pieces. 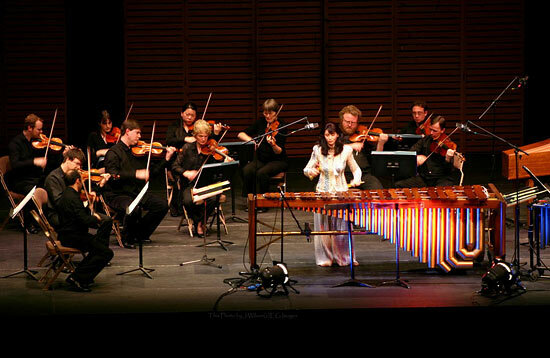 The first piece is by a British composer, Dominic Muldowney, and he uses a lot of equipment, ranging from marimba, vibraphone, boobams, tom-toms, cymbals, temple blocks, bass drum... Oh, I can’t remember what else! A few other bits and pieces! There’s quite a lot of equipment for that piece. The second piece I’ll be playing is, in fact, a snare drum concerto by the Icelandic composer Askell Masson. It’s the only snare drum concerto I’ve ever come across. It uses full symphony orchestra and then just this little snare drum. It lasts ten minutes and really it’s one of my favorite pieces. I can’t say that it’s a great piece of music; it really isn’t that, but it’s just a very effective, very musical piece that really uses the snare drum as a musical instrument. There aren’t really any kind of fancy techniques or anything, or just kind of gimmicks, or something like that. It isn’t about that. It’s sort of straightforward, but really good, solid playing involved. BD: Is it a study in rhythm? EG: No, fortunately! [Laughs] And I think this is an important point, and a good point for you to pick up, in that it’s very easy for percussion to be squared and for us not to think of phrases. Strangely enough, when we find untuned percussion writing, unpitched percussion writing, you very seldom see phrase marks actually in the music. You’ll find it for tuned percussion — marimba or xylophone — but never really for snare drum or timpani, or a multi set-up. And I don’t know why that should be! I don’t know why it should be any different because we’re always thinking of phrases. We always have a beginning, middle, and an end. When I play snare drum or tambourine or something, I’m always singing. I basically know where I want to go, and I have to exaggerate the phrasing because we are dealing with basically one instrument that has a color, as opposed to a pitch or a melody. So it’s harder to create the phrasing, but it’s so important that I have that sort of curved feeling in my playing, as opposed to always thinking about rhythm. And I think this is what Askell Masson achieves pretty well in his concerto, basically stating an idea, a theme, if you like, or a phrase, and then hearing it come back in different forms as the piece progresses. So you can actually make sense of it. BD: You mentioned before that sometimes the conductors had not worked with a percussion concerto. Are you still encountering resistance on the part of the public, when they’re used to symphony concert, to all of a sudden have this percussion group in front, played by you and assaulting their ears? BD: Do you have any advice for the subscriber who comes for the Beethoven overture and the Brahms symphony, and hears Glennie in the middle? EG: Just come along and really, really keep an open mind! That’s all I can say. If you like it, that’s wonderful. If you dislike it, well, that’s also wonderful. I don’t want to force people to enjoy this sort of thing. It’s up to them how they perceive it and basically it’s an area of music that needs to be explored. Percussion is actually going through an explosion at the moment. It’s developing very, very quickly! There are really, really fine, great players out there, and we’ve basically got to encourage the composers to keep writing music for us. It’s strange to think that when I was a student there were two concertos in the library at the Academy on London. Now, in my own library, I have over two hundred! So, that’s the extent of what there is for percussion! And it’s still growing. BD: What advice do you have for composers? EG: Please, please, go along to as many percussion concerts as possible, because each one is different. Percussion is so varied, and in many, many different cultures, percussion is the main family of instruments. BD: Such as the gamelan? EG: Gamelan, even, in Japan, or China. In Latin America we see percussion and Africa, of course. It’s really only in Europe where percussion has been featured and extended in the orchestras, hence why we have so many great orchestral percussion players. But we don’t have that big a tradition as far as the solo repertoire or ensemble repertoire. So, you have to, in a way, get into world music and just explore what’s out there and get together with the players. That's very important because young players who are leaving the colleges are equipped with new techniques! Now they can play with six mallets, and I’m struggling with four! [Laughs] But it’s wonderful. It’s nice to feel as though you’re part of the chain. BD: At what point, when you’re working on a piece, do you say it’s got to be two players rather than just one player; it’s just too much to cover? EG: I’ve only experienced that once, and it was really my fault for not paying attention to the score! I was playing a piece that actually was written for two percussionists, and I was desperately struggling with it thinking it was for one! I did it, but it was such a nightmare, I can’t tell you! [Laughs] A few days later, a friend of mine sent a little note to me, and he said, “Evelyn, I think this piece was written for two players,” and I died! Well, I didn’t die, but I really strangled the score! Also I had an organ and percussion piece written for me by the British composer Christopher Brown, and heavens, the amount of equipment that was used was just far too much! I so desperately wanted to play it on my own and it just wasn’t possible; it really wasn’t possible. So I got another player to help out, and he said to me, “Evelyn, this part could afford to have four players.” It was as busy as that. Even with two players we were rushing around. I’m not so keen on pieces where basically I have to worry about page turns, or getting from one set of instruments to another. I really just want to concentrate on the music. So, it’s a bit of advice for composers, maybe. BD: Let me ask you the big philosophical question: what is the purpose of music? EG: Well, I don’t think I can really answer that without giving it a lot of thought, but at this stage in my life, I feel that music, for me, is a language. It’s something I can communicate with. I get as much enjoyment out of playing music privately, i.e. to myself, as I do to a thousand, two thousand, however many people. And I think that the beauty of music is the communication between people. It doesn’t matter what color they are, whether they’re rich or poor, black or white, where they’re from — it doesn’t matter. The wonderful thing about percussion, especially, is that there are no class barriers. The extent that percussion is used throughout the world is quite considerable, and some of the really, really great percussion players are amateurs! It may be that they specialize in one area of percussion, but nevertheless, that’s their life. If we think of the music of Brazil, for example, it’s amazing. Or if we think about the Scots style of drumming, it’s people who really devote their lives to that particular thing. It’s just incredible being able to be in a position to share what they know, and at the end of the day, we’re all musicians who happen to play percussion, and we happen to speak the same language. That’s something that no one can take away. BD: A number of years ago we were doing environmental kind of compositions, and everything became instruments. Would it be possible for you to literally play every piece of furniture, every wall, and every chair in any room? EG: [Laughs] Wow! Well, I’ll have a go tonight! Just before I go to bed, I’ll try my hotel room — and be sure not to break anything. But yeah, I think it is. One of the things I noticed while I was in Brazil was when I was sitting at a table, just minding my own business, having a cup of coffee, and someone came up to me, and just started talking! I have no idea who this individual was or anything, and then we got talking about music. He had this box of matches, and I’m telling you, he created the most incredible feel just from this tiny box of matches. It was absolutely amazing. So I think it is possible to create something with anything. At the end of the day, we all drum away to ourselves, you know. We walk down the streets and there’s rhythm there, and so on. But it’s exploring it a wee bit farther and creating that emotional side as well, that I think is special. BD: Have you been in on the creation of any new musical instruments? EG: No, to be honest. Not yet, but it’s something that certainly interests me. If a composer wants a particular sound, then I hate to say, “Well, it’s impossible,” or, “There isn’t an instrument that can cope with your needs.” I really, really try to find someone who could perhaps make something. One of the interesting things for me in my travels is to come across all the different percussion instruments throughout the world. And there are many, many, many that I still haven’t seen and probably never will. But it gives me lots of ideas to take to the instrument makers, and say, “Why don’t you use this idea and create a particular sound?” Or I may just draw something and give it to them, and just ask them to go away and think about it and create something just out of curiosity, really, more than having any sort of musical idea or thought. But take someone such as Harry Partch. His instrument collection is absolutely amazing and something like that I’m very interested in. So I haven’t been involved in it in the past, but it’s certainly there to be explored. BD: Have people come to you with new instruments to try? BD: Does it ever surprise the audience that here is this lovely, smallish, young lady getting an immense amount of sound out of all of these instruments? EG: Well, I don’t know if I’m so small, but sometimes people will say, “Oh, you must have a lot of muscle to play the drums, or timpani, or marimba, or whatever.” And I would say, “Well, actually, no, you don’t need muscle. You just need to be supple.” You need to be relaxed. Basic things need to be looked at like postured. Just having the instruments at the height that suitable for you is very important. I very seldom wear shoes when I play. It means that I have a better spring and I can move around like a cat in that I don’t make a sound getting from one set of instruments to the other! I don’t know; it’s something I don’t really think about. I just basically plow my body weight into the instrument, and then I just get the sound that I’m after. But I’m not aggressive towards the instruments. I don’t insult the instruments, but I like to know that the equipment can stand a good beating. I hate using the word, but you know what I mean. I can sort of launch myself, dive into the instrument if I want to. BD: When you’re playing, how much is art and how much is entertainment? EG: Again, it’s something I don’t really think about. Strangely enough, when I look at myself on a video or a TV, then I think to myself, “Gosh, do I really look like that? Do I have those terrible bad habits when I play?” When I play, I just play how I feel and that’s it. I don’t think about how far my sticks are being raised or how flashy things look. I play how I feel comfortable. I position the instruments so that they feel good to me. I wear things that feel good to me, things that are practical. So things such as wearing long, frilly frocks, for example, is not my cup of tea, I have to say. But also, you know, I could catch my sleeve on a cymbal stand or something, and heavens above, I can’t imagine! So I just like to wear practical things, and I feel as though I like to give a sort of honest performance. I like to give how I feel at that moment in time, so it’s like a quick snapshot that you have of my playing. Obviously I like to make things look good, as far as taking advantage of lighting and things like that. I think that’s very important to explore more in my recitals, because sometimes orchestras may want to keep straight lighting, and that’s it. But they are getting around to having some interesting lighting to suit the piece, and I like to explore that a wee bit. So it depends, really. It depends on the situation. BD: Is the music that you play for everyone? 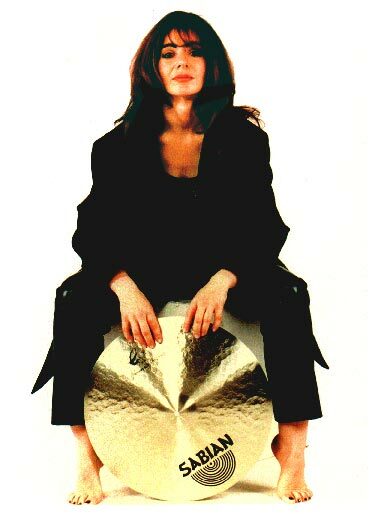 BD: Are they now going to say, “This is how Evelyn Glennie did it, so let’s learn from her”? EG: Well, I don’t know if they’ll do that, but they can perhaps gain ideas and they can analyze my programming as to why did I program like that. But I’m changing my programs all the time, and I have to understand first of all who I’m playing to. For example, if I’m asked to play at the Huddersfield Contemporary Music Festival, then I know I can afford to program Stockhausen or Xenakis or Henze, or Berio. It’s a particular audience that will be there, and it’s a particular festival. If I’m asked to play at many of the summer festivals where there will be a mixed audience, then I’ll present a mixed program. There will be contemporary music, there’ll be ragtime music, or arrangements, things like that. It may be that in an orchestral situation, that the organizers will say, “We have a French theme,” or a Latin theme, or whatever, and then I’ll present repertoires accordingly. Sometimes I choose well, and sometimes not. You just learn, you know, you really do. But that’s part of the fun, I think. BD: Are you ever able to go to concerts? EG: Oh, yes. The reason I don’t go to as many as I’d like to is time. Sometimes when I get home, I just like to be at home. But yes, I do. I like to go to orchestral concerts. I don’t like chamber music so much; that’s harder to perceive. I like to go to folk music concerts. Pop music I’d love to experience more, but I just haven’t been able to get around to that. I usually like to feel as though I can go to concerts, but the time when I am able to do that, oddly enough, is if I’m touring. So if I have a spare evening, instead of sort of sitting in the hotel room, I usually find out what’s going on in town and go to whichever one suits me. But it helps if I know the repertoire; that really does. But sometimes I go out of curiosity, so I suppose it’s for the same reasons as many other people. BD: Do you have any kind of passion to try to bring music to other deaf people? EG: Well, I think that I don’t involve myself with other deaf people that much. I mean, basically I’m just a musician who has, you know, a job to do. And I find that—I used to work a lot with deaf kids, especially, and it was very easy to get wrapped up in that! So lots of different organizations wanted you. And in a way, they expected miracles, I suppose, because they felt that if I could play an instrument, all deaf people should be able to play an instrument, and this is a fact. And of course, it can’t happen. You know, if they’re not interested in music, they’re not interested! BD: That would be like Perlman going out, and all of the other crippled children would be able to play the violin. EG: Exactly right! Exactly. It was sometimes difficult to allow people to understand. I find that what I like to do when I am giving workshops or master classes is to have a mixed audience, so to have hearing kids and hearing-impaired kids. They can learn from each other. But basically I don’t alter what I do, and I find that this is a better way to approach it. That they can sit where they want and if they want to hold a balloon in order to feel things more, then that’s fine. If they want to sit there without their shoes on, that’s fine. If they want to sit close to the instrument, that’s fine. In some of the recitals we have a group of deaf people that will be sitting at the side of the stage — in the wings, but at the side — so that they can receive more, if that suits them. But they have to make that decision and basically I just play to them. I just play, and at the end of the day, each individual hears music differently. I can’t say to them, “Well, this is how you experience the marimba,” or, “This is how you experience the drum.” This is how I experience the marimba, or a drum, but now you must find your own way. Some deaf people can hear well in the high register and not so well in the low register, or vice versa. We all hear differently and I’m not in a position to say how you can do something. I’m not an audiologist; I’m just me. I just happen to be a musician who happens to be deaf, who happens to play percussion, who happens to have brown hair, and so on! BD: Thank you for sharing your music with all of us. EG: You’re welcome, thank you. BD: Thank you for speaking with me today. EG: Oh, it’s a pleasure. 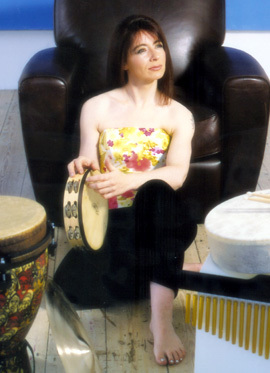 Evelyn is the first person in musical history to successfully create and sustain a full-time career as a solo percussionist. As one of the most eclectic and innovative musicians on the scene today she is constantly redefining the goals and expectations of percussion, and creating performances of such vitality that they almost constitute a new type of performance. Evelyn gives more than 100 performances a year worldwide, performing with the greatest conductors, orchestras, and artists. For the first ten years of her career virtually every performance she gave was in some way a first. Her diversity of collaborations have included performances artists such as Nana Vasconcelos, Kodo, Bela Fleck, Bjork, Bobby McFerrin, Sting, Emmanuel Ax, Kings Singers, Mormon Tabernacle Choir and Fred Frith. 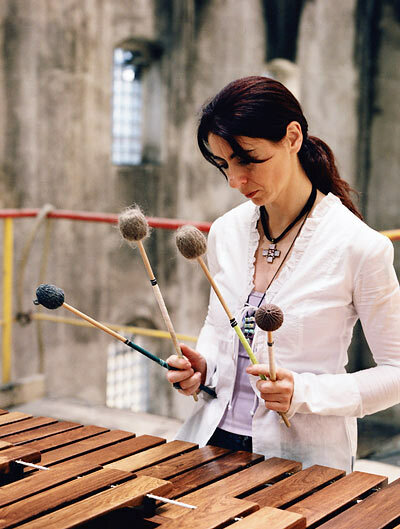 Evelyn has commissioned one hundred and fifty new works for solo percussion from many of the world's most eminent composers and also composes and records music for film and television. Her first high quality drama produced a score so original she was nominated for a British Academy of Film and Television Arts awards (BAFTA's); the UK equivalent of the Oscars. Out of the 25 recordings made so far, Evelyn's first CD, Bartok's Sonata for two Pianos and Percussion won her a Grammy in 1988. A further two Grammy nominations followed, one of which she won for a collaboration with Bela Fleck. Evelyn's twelfth solo CD, Shadow Behind the Iron Sun (BMG Records), was based on a radical improvisational concept and has once again questioned people's expectations. 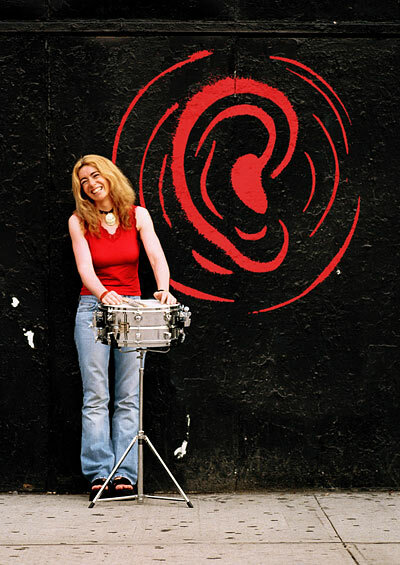 The Evelyn Glennie brand is constantly exploring other areas of creativity. From writing a best selling autobiography, Good Vibrations, to collaborating with the renowned film director Thomas Riedelsheimer on a film called Touch the Sound, to presenting two series of her own television programmes (Soundbites) for the BBC, to regularly appearing on television across the world, which include The David Letterman Show (USA), Sesame Street (USA), The South Bank Show (UK), presenting and performing on Songs of Praise (UK), Commonwealth Games Festival Concert, This is Your Life (UK), 60 minutes (USA), PBS Profile (USA) and many more. Evelyn's activities also include lobbying the Government on political issues, her consortium with Sir James Galway, Julian Lloyd Webber and the late Michael Caman successfuly led to the Government providing £332. million towards music education. 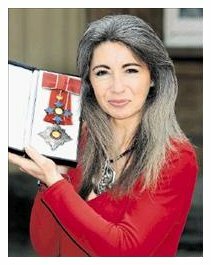 Other aspects include Evelyn Glennie Images, which supplies photographs from a vast image library of Evelyn, Evelyn Glennie Jewellery, which is a range of Jewellery designed in conjunction with Ortak is based on her influences as a solo percussionist and Evelyn Glennie Merchandise. Evelyn is also an international motivational speaker to many diverse corporate companies and events. Evelyn also performs with Orchestras on the Great Highland Bagpipes. After 20 years in the music business she has begun teaching privately, which allows her to explore the art of teaching and to explore the world of sound therapy as a means of communication. In 1993 Evelyn was awarded the OBE (Officer of the British Empire). This was extended in 2007 to 'Dame Commander' for her services to music [photo at right], and to date has received over 80 international awards. This interview was recorded on February 21, 1994. Portions were used (along with recordings) on WNIB in 1995 and again in 2000; on WNUR in 2006; and also on Contemporary Classical Internet Radio in 2006. A copy of the audio interview was placed in the Archive of Contemporary Music at Northwestern University. This transcription was made in 2008 and was posted on this website that September, and was also placed in the Oral History American Music Archive of Yale University.